Ramblings from the politically minded nature nutter who happens to be the husband of the novelist, Marcia Willett. Welcome to the regular Friday blog. Last Sunday and something quite unexpected happened. The sun shone, it was warm, there was spring in the air. 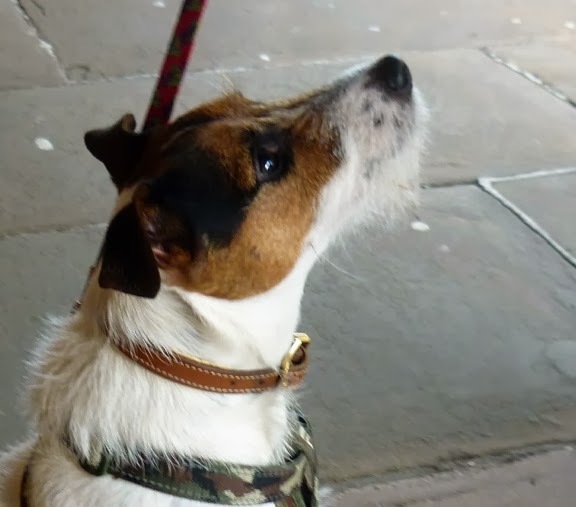 Then, also out of the blue, Marcia received a text from a friend of ours: he was on his way to Totnes with his family (and dog) - could we meet? 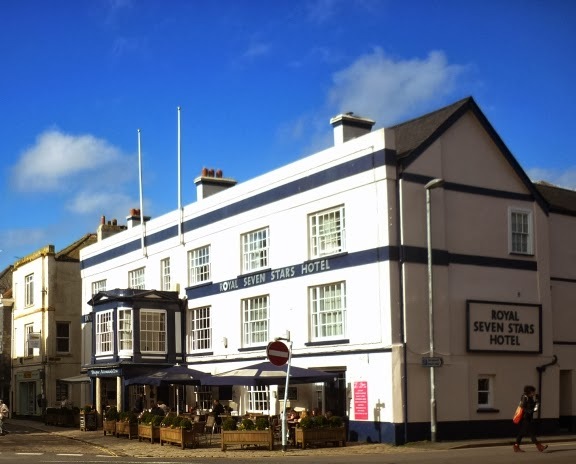 So it was that found ourselves sitting outside the Royal Seven Stars enjoying excellent coffee and listening to his plans. 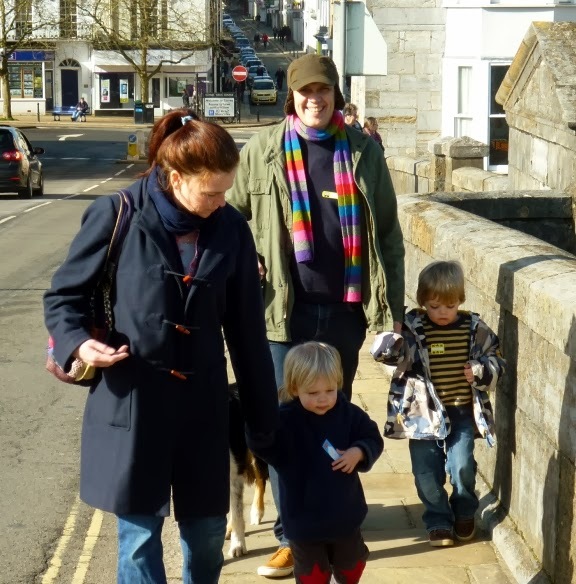 Allow me to introduce David Hurst, his wife Debs and two small sons, Daniel and Darley . . . and Colin their collie cross, destined to be the blog dog next week. David worked for the Evening Standard as an editor until deciding that life in some rural spot would be better for them as a family rather than living in London. Accordingly they bought a cottage in Devon and David became a freelance writer. He is a very good journalist and works very hard so, almost against the odds, is very succesful. This next part of the story came as a bit of a shock - you will see why in a moment. 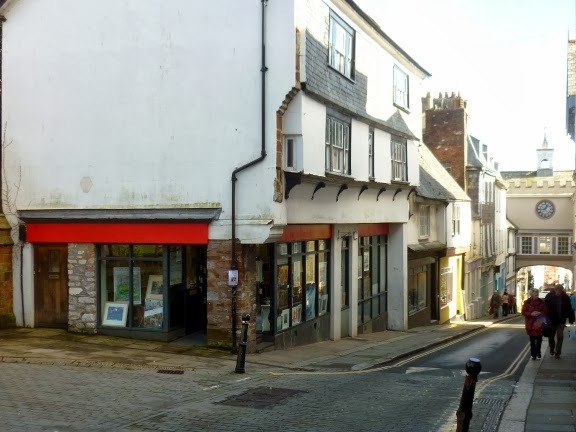 Before we left Totnes, I noticed something I had never seen before. This building on the left used to house the old Bradford and Bingley Building Society where I had an account at about the time we set off on our journeys around the country. What did I see? The first floor windows - detail below. Shortly they will be setting off in a camper van - but leaving Colin with Debs' mother - and will be spending a fortnight travelling around Spain, spending time in various camp sites. All of this will result in an article about exploring that part of the world in a camper van with two smalls - four and two-years old. Watch this space for further news on this adventure. I love these little details - see the stonework to the left and that little window looking up the road. Now let us wind the clock back about thirty years. The year before there had been a "Village Ventures" competition throughout England supported by the Duke of Edinburgh and sponsored by Shell. I was to write a short book describing some of the more interesting entries into the competition and this meant, obviously, that I had to visit the various places to find out what people had been doing and to interview the movers and shakers. 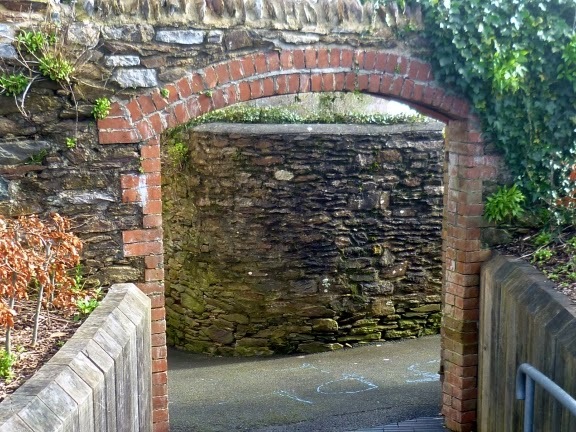 The walk back to the car took us through this arch into one of the many narrow lanes in the old part of the town. So it was that two adults, Marcia and I, set off in a camper van with two smalls. The basic difference was that our smalls were both dogs. We made three trips in all: the first took us up the western since of the country and back down through the Midlands, the second covered the eastern side and East Anglia and the last started in Bath and then followed the Kennet and Avon canal and the River Thames towards London before swinging south to visit the counties bordering the English Channel. 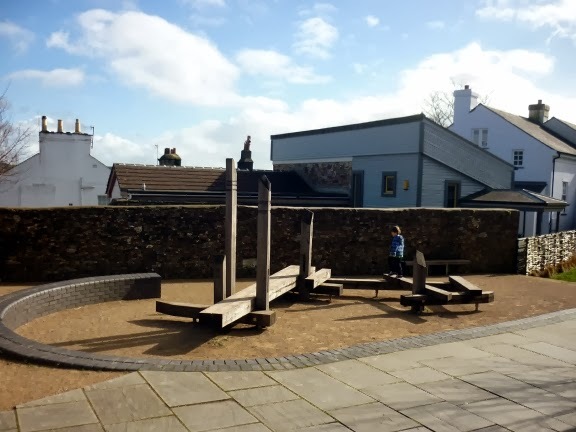 We had already passed the children's play area made from old house timbers. Three events in particular stick in my mind. 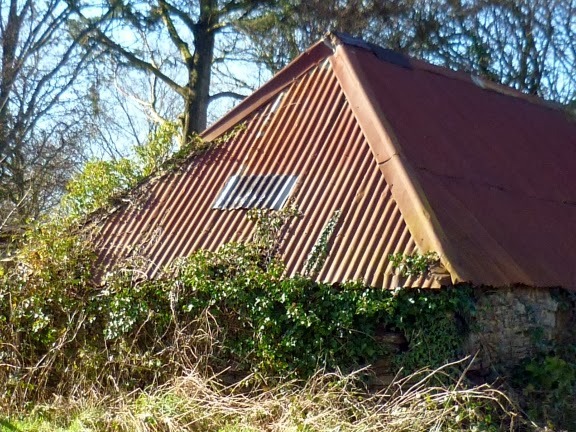 In a small village in Shropshire, a village hall had been built which combined a number of functions. One of these was a doctor's surgery. The doctor in question was a delightful character who, half way through the interview, jumped up and sat cross-legged on a work top (we were talking in the hall's kitchen) looking like a very benevolent gnome. 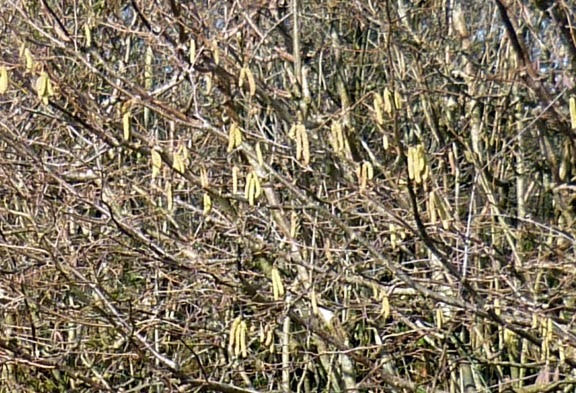 On the way home we saw our first hazel catkins proving that spring is on the way . . .
Then there was Carlisle. I should explain that our camper van was an old Bedford with a three speed gearbox with the gear lever on the steering wheel column. Over time the links below had worn and every now and then she would jam in neutral. The cure was to jump out, crawl underneath and pull one of the levers back to reset everything. In the centre of Carlisle in a square that has traffic criss-crossing it in every direction and in the rush hour this is exactly what happened. A very small and very efficient young policewoman very kindly stopped all the traffic so that I could effect the needed adjustments.
. . . and another example of corrugated iron. Finally we can to the water. 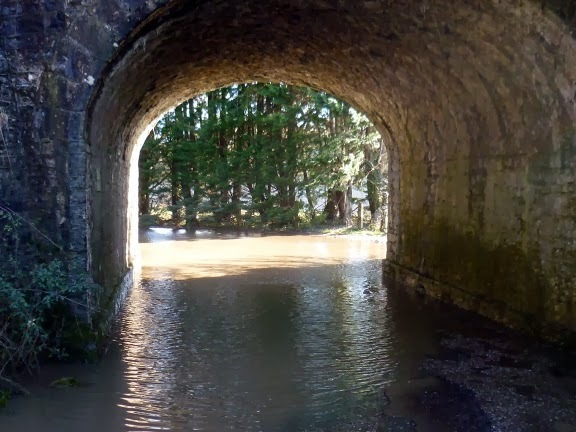 The lane passes under the main railway line and, as you can see, it was flooded. "You're not going to drive through that, are you?" asked Marcia. "Well, it's either that or we turn round and go back to the main road." Then as we were wondering what to do, a woman arrived (wearing gumboots, of course) and she told us that if we kept in the middle it should be all right. And it was. Hopefully David, Debs, Daniel and Darley will encounter nothing but sunshine and friendliness wherever they go. 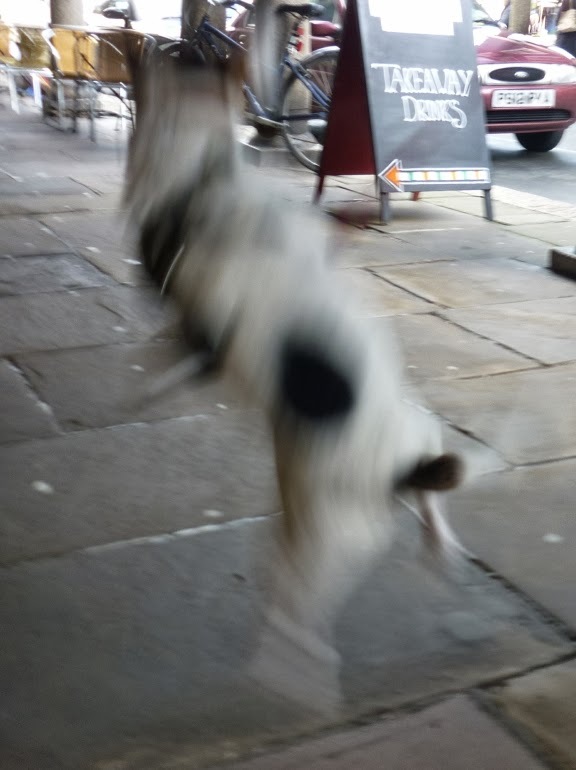 This week's blog dog is called Charlie. Charlie bounces a lot and most of the photographs, such as the one to the left, demonstrated this habit which, from the photographers point of view is unhelpful. Luckily his owner had a treat in her pocket which, as you can see in the top picture, overcame all such tendencies which were instantly replaced by intense concentration. These are always welcome. Please send them as an attachment to mail@devonwriters.co.uk. Size is quite important: the ideal is about 8 inches wide at a resolution of 96 dpi (if that means anything to you). Bigger and they take ages to upload at your end and to download here: smaller and they don't look that good. 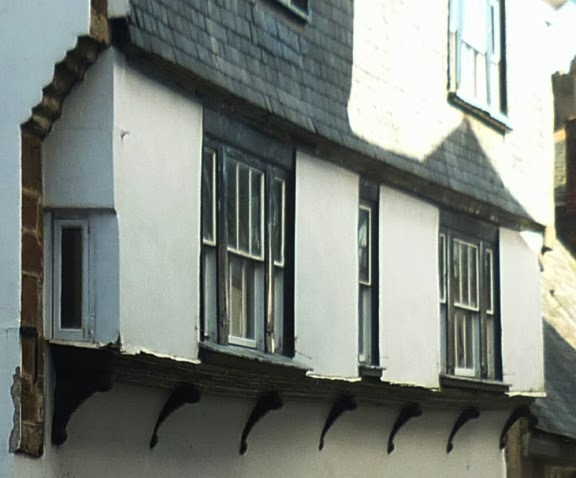 To buy Marcia Willett's Dartmouth - a companion to her novels Hattie's Mill and Second Time Around which I have written, please CLICK HERE. I am working on a new web site on which I am gradually putting a small selection of the photographs I have taken over the years. To have a look, click here.